If there is one thing striking about the modern high school it’s the focus that can be given to specific programs. 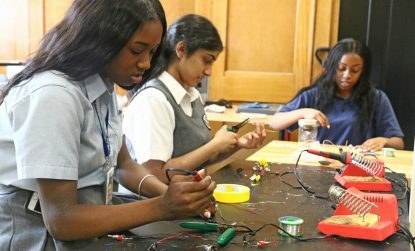 Take West Catholic Preparatory High School, in West Philadelphia, where the Engineering and Design Academy is a school within a school. Not every student who signs up for the program will eventually enter those fields, according to Dr. Ryan Baxter, who teaches engineering and physics at West. “Engineering is one pathway,” he said. The program is also attractive to students who want to pursue a hands-on career geared to the manufacturing industries, learning how things are made, what tools they need and the kind of thinking and skills they would need. In addition to learning some of the theory behind the engineering field there are practical applications in using some of the basic tools of the trade, as well as fun projects. Did you know you can make chairs entirely out of cardboard that are strong enough to support 200 pounds? The West kids did just that. One caveat, please don’t leave them out in the rain. 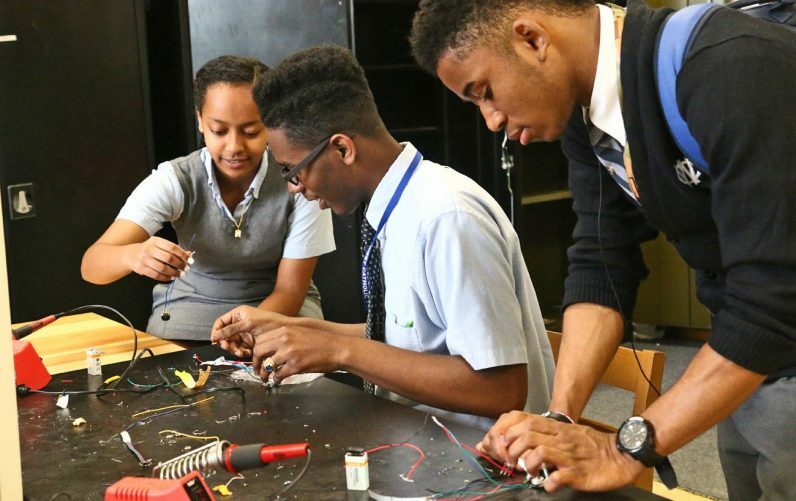 Within the Engineering and Design Academy there is, on club level, a high school chapter of the National Society of Black Engineers (NSBE), which is appropriate. 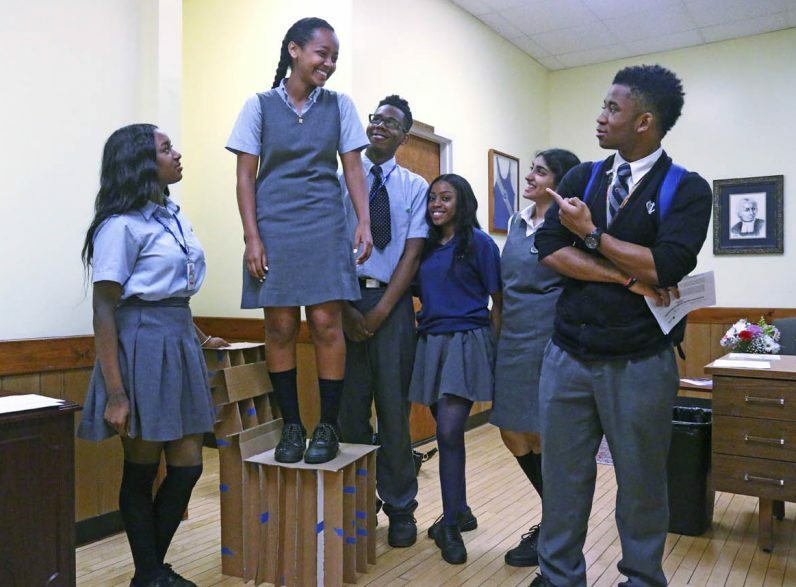 Because of its location, West Catholic has a very high African-American enrollment and the idea is to promote engineering among them as a rewarding future career. The NSBE club works closely with the college-level club at nearby Drexel University and also brings in professionals who can address the opportunities available in the many facets of engineering. Not everyone who takes the courses of the Engineering and Design Academy and has been a member of NSBE will necessarily continue on with engineering at the college level but Baxter believes they have profited from their experience at West. Six of this year’s upcoming June graduates spoke of their immediate plans. Amaya Jenkins, has been in the engineering program since her freshman year. She is headed for Coppin State University in Baltimore where she intends to study business and marketing. Although she enjoyed learning some engineering skills, she would be more interested in the marketing side of the field. Eliz Benny will be attending St. John’s University and majoring in biology with the intent of becoming a physical therapist. At West she especially enjoyed the mentoring she received through NSBE. “They taught me how to get the most out of the program and how to pursue my college education,” she said. Maerone Alfa, who is this year’s president of the NSBE group at West, is headed for the University of Pennsylvania. She was just honored as one of the Archdiocesan Distinguished Scholars and will be the valedictorian at the West graduation. Engineering has been her long-time goal. “I want to study engineering, bioengineering and the mechanics of physical science,” she said. She intends to stay with NSBE in the future because “I want to help other people realize a passion for engineering,” she said. Whatever these upcoming graduates do in the future, their time with West Catholic Preparatory clearly has not been wasted.